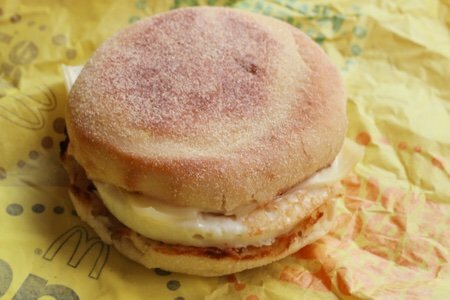 The Egg McMuffin can be ordered 24 hours a day at McDonald’s. For fans of this famous sandwich, this is good news. 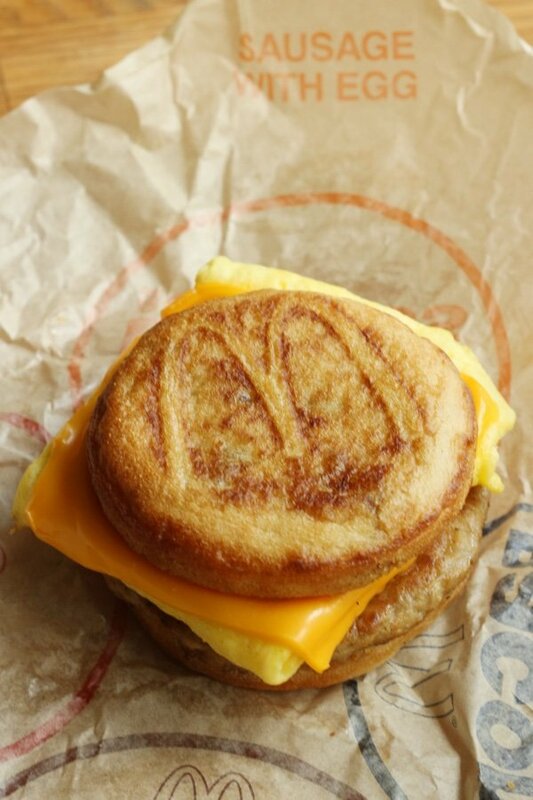 The Egg McMuffin has always been one of my favorites so I was excited when McD’s debuted the all day breakfast. I was surprised by one addition – the McGriddle (which I had never heard of). McDonald’s has been flaunting how the Egg McMuffin is now made with real butter so I decided to give it a try. First, when I order the sandwich, I NEVER get the sausage or Canadian bacon. Both are too salty and are more calories than I want. I used to drop the cheese because I hate American cheese. Guess what? Not only does McDonald’s now use real butter (good for them) they have real cheddar cheese. Not kidding. So I ask them to add cheddar and I am pretty happy about that because the egg and English muffin are kinda dry on their own. As you can see, I ended up with a sandwich that didn’t have an egg yolk. I believe you can order only the white at some McDonald’s but this was a mistake. Oh well. Is it super healthy? No. If I wanted to make it healthy, I would use a whole grain English muffin and add things like tomato and spinach to the sandwich. But, is it much better than most things you can order at McDonald’s? Yes. A good example of a sandwich you need to stay far away from is the McGriddle. Since I never had one, I decided to try it with all the fixins (even the American cheese). I believe the McGriddle's concept is that you have eggs, sausage, and pancakes in one sandwich. Why you need cheese on this sandwich escapes me but what do I know? I never have cheese if I am eating pancakes, sausage, and eggs. Does everyone else do this and I am just clueless? I know what you are thinking. How do you make something like this and not feel bad about it? 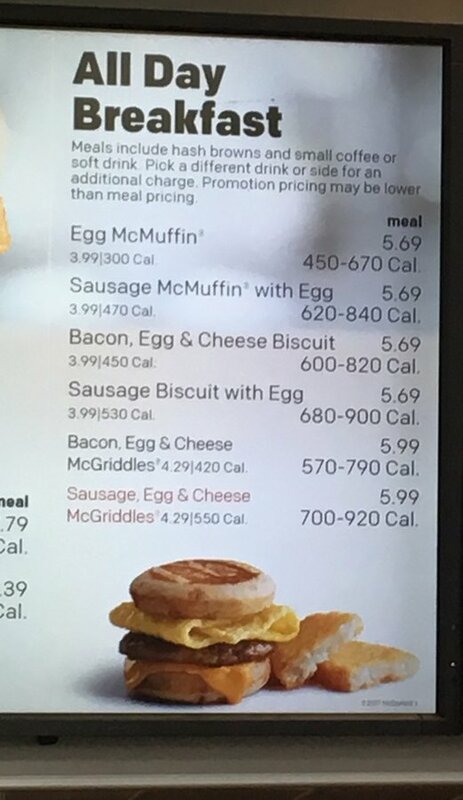 Even without the sausage and the cheese it is more calories than the Egg McMuffin and has 15 grams of sugar and 800 mg of sodium. Of course, when I visited McD’s EVERYONE was ordering the McGriddle and it does taste pretty good. I felt like my heart was racing after I ate it. It may have been in shock because I almost never consume that many calories in such a short period of time. The sandwich is small. 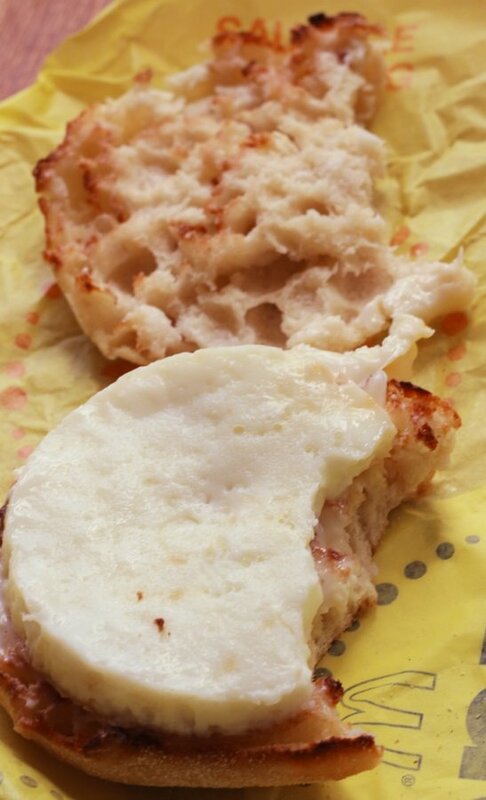 What do you think of the Egg McMuffin? Is it one of your standards when you forget to pack your lunch? Is the Grilled Chicken at McDonald’s Healthy? SUBWAY Veggie Delight: FAST But Fresh and Healthy? SUBWAY Veggie Delight is the poster sandwich for a healthy fast food choice. The ingredients include whole wheat bread and a ton of veggies. We only go to McDonald's when we're on a road trip. I always order the yogurt parfait because I want the calcium. It's high in sugar, I know, but low in calories. I've been tempted to get the Egg McMuffin but, sitting in the car most of the day, I try to save calories for other meals. I only go to McD's to get the egg white delight sandwich which is only on the breakfast menu. I order mine with extra Canadian bacon and no butter. 6SP without the butter. Very filling. When we eat breakfast at McDonald's during early morning road trips, I always order Egg McMuffin without butter to save calories. My husband gets the parfait and a a sandwich without an egg. In ordering my sandwich that way I am sure that I am getting a fresh sandwich. During my pregnancies, I had morning sickness but had to teach second grade. I would go through the close McDonald's and order an Egg McMuffin without butter and it helped me get through the morning. I rarely have them, but I do enjoy them when I do. I don't even attempt to justify a trip to McDonald's save for the occasional $1 ice cream cone in the summer. I am at a point in my life where I must watch my numbers and there are other restaurants where I can actually enjoy a splurge. We are certainly on opposing trains of thought today, LOL. I'm trying to concoct an orzo salad without orzo and you're sampling Mcgriddles! I decided to 'rice' a head of cauliflower in lieu of the orzo, and take your advice, no Mcgriddle. I wish you hadn't liked it because it makes it easier to pass on for those trying but the heart-racing effect should be scary enough. Mc'anything' goes straight to the midriff and is pretty unhealthy. No matter how enticing their ads are, remember they're a profit-driven corporation, not concerned with quality or health, just an illusion of it. Most times we know our area. Create healthy options, local delis, markets, mom 'n pop luncheonettes, even diners. In a pinch a mini-mart has yogurt and a piece of fruit. A year ago my son moved to Boston to start his career; within a week he found his default lunch spot, Life Alive. We all go off ideal eating plans but, for me anyway, its going to be special and yummy not fast food. Sorry for same ole rant, :) still love the review! Had to laugh when I saw this after I had just gotten back from getting an egg mcmuffin at McDonald's. Wish I knew you could order without butter. Didn't even realize that, though I did say without cheese. It has been a long time since I was at a McDonald's. Funny I should see this today because it's payday and I was just going to get an Egg McMuffin before grocery shopping. I usually get it without the butter or cheese but it is dry and I feel like I am not getting my monies worth. I like it much better with the cheese. Love Egg McMuffins and also the Egg White Delight! Never occurred to me to order without butter! Thanks for the tip - I know I wouldn't miss it. When we travel, my breakfast choice is always an Egg McMuffin. I love them. I feel that (for me) it's a decent breakfast without going overboard on the calories since we're just sitting in the car. That's about the only time I eat them and it easily fits into my healthy eating plan. I've been Lifetime with WW for almost five years now and sometimes you have to enjoy eating what you love - within reason. I love your website and the great things you share with all of us! @mcdonald's. soooo many better choices to spend calories on. I like the coffee at McD's and have ordered the egg mcMuffin for my mother, but since I want her to have extra protein, I order it with two eggs, and no bacon or sausage. I had no idea that they even added butter, so now I know to ask them not to put it on. Thanks for the tip. Today, before I got groceries, I went to McDonald's and ordered a freshly made sausage burrito without cheese(already has egg and sausage) and no sauce. With that I ordered a unsweetened ice tea with one Splenda. It knocked the calories way down as well as the price. Stinker to lose your yolk! Your sandwich came with an egg white only because that is the standard change-order. Their online ads say: "Customers can also get egg whites and white cheddar on any breakfast sandwich for a new twist on their favorite tastes," so if you didn't specify that you didn't want egg whites, you probably got them by default. I always get the cheddar and never thought to ask for the sandwich with the whole egg instead of the white. Now that I think of it, I'm going to do it. I would prefer the cheddar with the whole egg! The egg McMuffin according to my aunts weight watchers app (freestyle) is only 7 points. I dislike processed cheese (no reveal cheddar here in Nova Scotia) so that eliminates 2 points. So my egg McMuffin becomes 5! Instead of the muffin I was eating at 15 points, ewww!